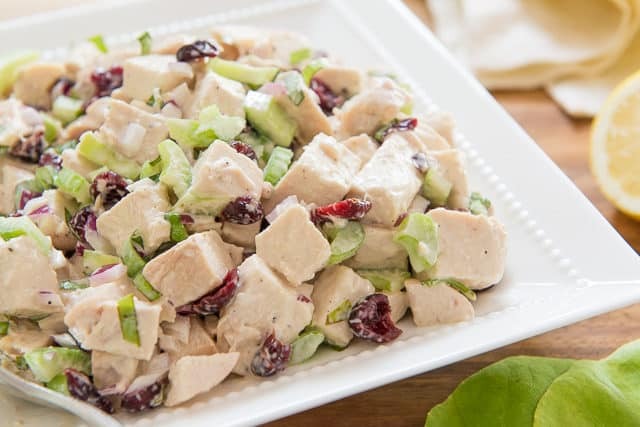 This simple and tasty Cranberry Chicken Salad is a great fridge staple for a quick, protein-filled snack or sandwich filling. It’s also perfect for picnics and potlucks! Chicken salad can be made a million different ways, but this is my classic, the one I come back to again and again. Chicken Salad is also one of the most regular meals in my eating rotation (along with Salmon Salad and Egg Salad, my other two favorites). It’s one of the few savory, healthy foods that doesn’t need to be eaten warm, so it can be packed for lunch, picnics, and potlucks. Also, if you’re the type of person who needs to keep healthy, ready-to-eat dishes in your fridge in order to stay away from the pantry (yes, that’s me! ), this is delicious and filing enough to keep me eating well. I just know that if I open the refrigerator door and there’s nothing inside to nibble on, stop #2 is the pantry, hah! Need a quick lunch? Layer some chicken salad on crusty bread with tomato slices and greens, and you’re set. Need to nibble on a little bit of protein? I grab a whole wheat cracker, put a spoonful of chicken salad on it, and find that it tides me over for a while. I use this Crockpot Chicken Breast method for the cooked chicken in all my chicken salads. I’ve tried pretty much every cooking method with chicken breast: baking at various temperatures, grilling, broiling, poaching, and cooking in the Instant Pot, and making the chicken in the slow cooker is both easiest and results in the most juicy, evenly cooked chicken. There’s one more very important ingredient for the chicken salad…time! The chicken salad gets better when it gets a chance to sit in the fridge. That allows the flavors to meld, and also lets the cranberries plump up and get juicy. The good news is that leftovers keep very well, which is why it’s the perfect fridge staple. I make those all the time too for picnics, lunches, and general fridge snacking. Happy cooking! 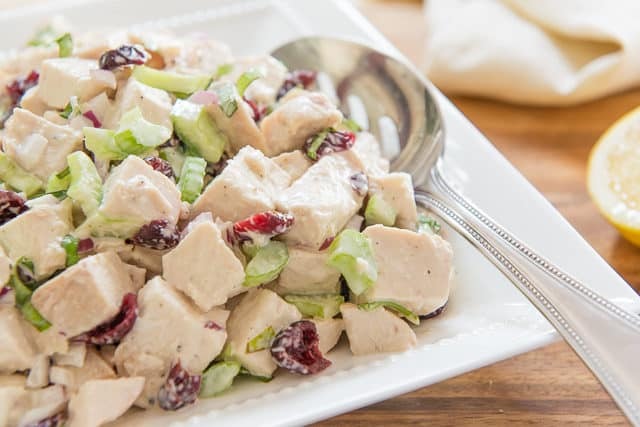 Can you freeze cranberry chicken salad? The celery and basil don’t freeze well, so it’s not recommended. Leftovers will last in the fridge for about 5 days. 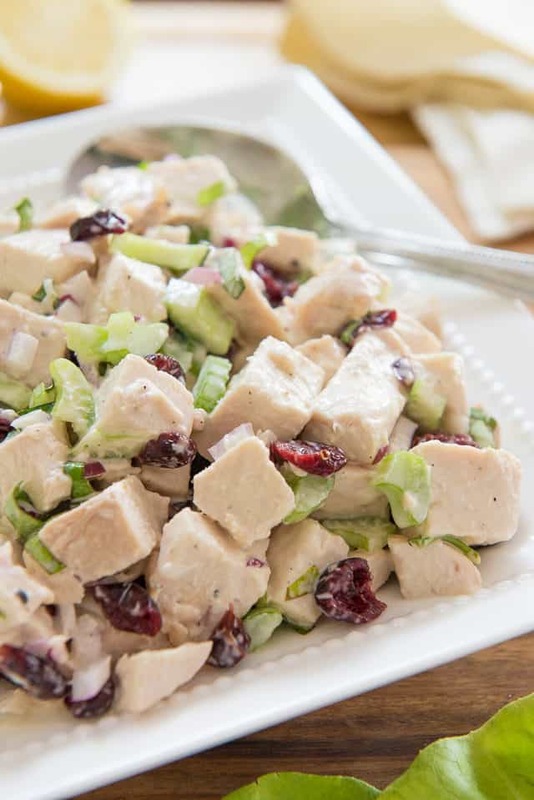 This simple and tasty Cranberry Chicken Salad is a great fridge staple for a quick, protein-filled snack or sandwich filling. 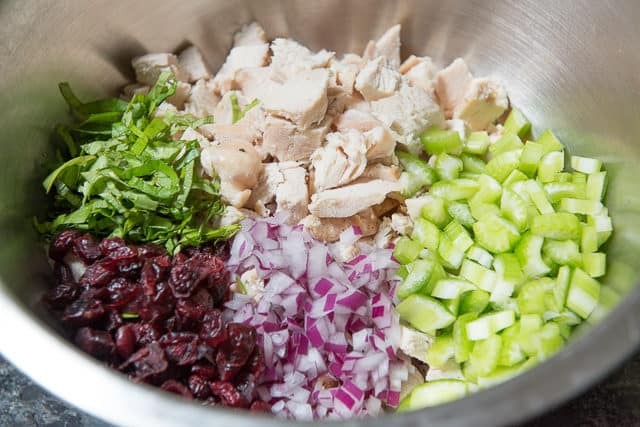 In a large bowl, combine the chicken breast, celery, red onion, basil, and cranberries. 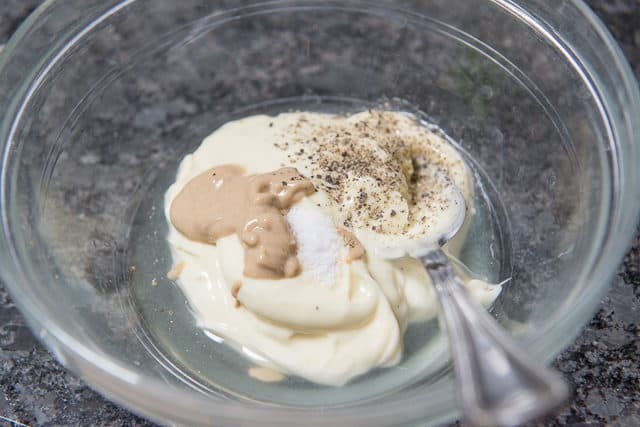 In a small bowl, whisk to combine the mayonnaise, lemon juice, mustard, salt, and pepper. 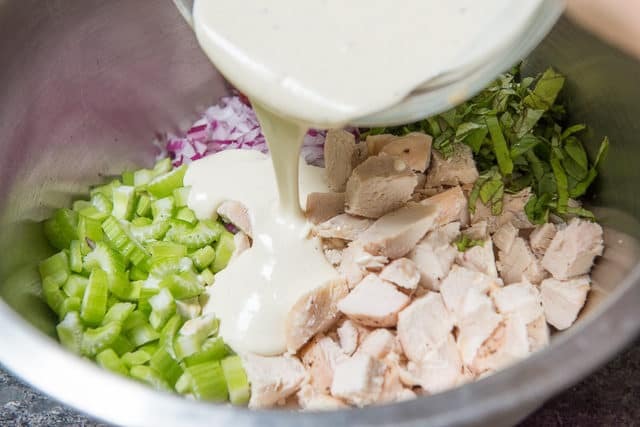 Pour the dressing all over the chicken, then toss well to coat. 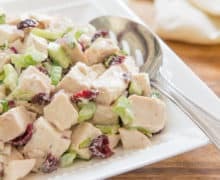 Ideally, refrigerate the chicken salad for an hour or two before serving, so the flavors can meld and the cranberries can plump up. Then enjoy! Post updated with new photos, writing, and tips in July 2018. Originally published in June 2014. Disclosure: this post contains an Amazon affiliate link. We’ve been loving chicken salad lately. This looks like the version I need to try next!